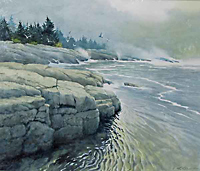 Maine painter Richard Roflow loves to paint the intimate details of the landscape that he encounters on near his home and studio on Deer Isle, as well as the iconic images of Acadia National Park. He came by his love of painting nature early in life, though his formal education was at the Cincinnati Art Academy in the 1950’s. 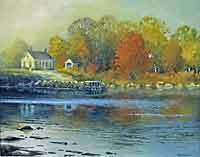 Now over 50 years later most of his paintings are inspired by the drama of the Maine coast and coastal weather. "He rarely paints on a sunny day. It's always misty, foggy, and dramatic. He paints those days that Mainers know as being a Maine day," said Barbara Entzminger, whose Bar Harbor Birdnest Gallery exhibited many of Roflow's paintings in years past. "I consider myself a light painter. I try to paint the light I see and how it creates distances," Roflow said, explaining the prominence given to plays of light in his compositions. "Roflow captures the qualities of atmosphere and its light-color shows which most of us hardly notice," writes Fran Watson. "Tiny droplets of moisture in the air act as color magnifiers, bathing landscape in eerie glows of uncommon intensity for brief moments, transforming the ordinary into the exotic. The most familiar objects attain an importance through his eyes as he renders them with a combination of softness and accuracy. His depictions are tinted fragments of hushed time, caught in the manner of masters like Corot and Daubigny whose visions changed rural simplicity into mythological magic." Roflow, a two-time winner in the National Park Academy of the Arts competition, Arts for the Parks was recently honored as the Maine artist featured in the Presidential suite of the Bar Harbor Regency reserved for President Obama and his family for their visit in July, 2010.